Serena William's lasting influence Jump to media player She may have been denied the calendar slam. But Serena Williams and her sister Venus have created a legacy by inspiring more African-Americans children to play tennis. Highlights: Serena wins sixth title Jump to media player Watch highlights as American Serena Williams beats Spain's Garbine Muguruza to win her sixth women's singles title. A channel that's young, British, witty and black Jump to media player An alternative YouTube channel for black British audiences is finding a growing audience. Courtroom where children are judges Jump to media player A new court in Hampshire has a panel of young people to help decide how to deal with the crimes of their peers. Serena Williams' hopes of securing a calendar Grand Slam were ended in stunning fashion by Italy's Roberta Vinci in the US Open semi-finals. But Williams and her sister Venus have already created a legacy by inspiring more African-American children - especially those from low-income areas - to play tennis. The sisters have championed a tennis centre in the Anacostia neighbourhood of Washington, DC, devoting time and money to it's development. 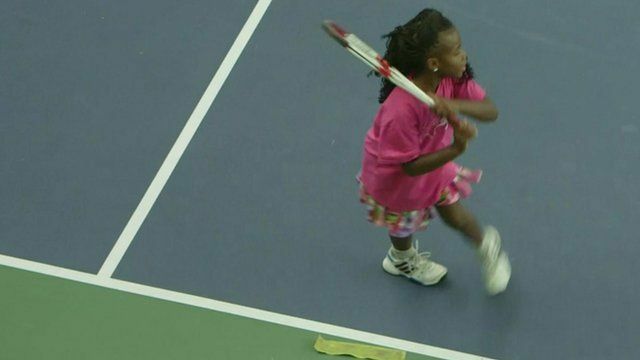 Tennis students taking lessons at the Venus and Serena Williams Tennis Arena at the Southeast Tennis and Learning Center tell the BBC how the sisters have inspired them. Produced by Sarah McHaney, filmed by Colm O'Molloy, edited by Olivia Lace-Evans.